U.S. stocks are little changed Thursday morning as the market's recent rally loses steam. Health care and communications companies are edging upward while banks and technology companies are slipping. Morgan Stanley dropped after its fourth-quarter results fell short of Wall Street's expectations while railroad operator CSX fell after forecasting weaker revenue growth in 2019. KEEPING SCORE: The S&P 500 index stayed at 2,615 as of 10:15 a.m. Eastern time. 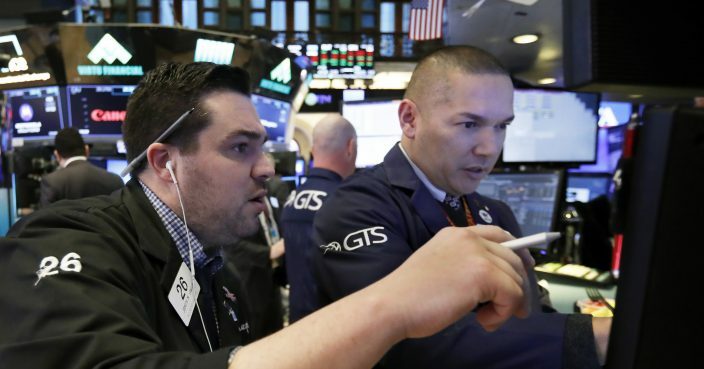 The Dow Jones Industrial Average slipped 37 points, or 0.2 percent, to 24,170. The Nasdaq composite gained 5 points, or 0.1 percent, to 7,040. The Russell 2000 index of smaller-company stocks added 3 points, or 0.2 percent, to 1,458. BANKS CLANK: Morgan Stanley skidded 6.1 percent to $41.79 after its earnings and revenue disappointed analysts. Like a number of other big financial companies, Morgan Stanley was hurt by difficulties in trading during the volatile fourth quarter. While Morgan Stanley's traders are considered some of the best in the business, their stock trading revenue was flat over the last three months of the year and bond trading revenue tumbled 30 percent. The S&P 500 lost 14 percent during the last quarter of the year. Other banks also traded lower. KeyCorp lost 4.4 percent to $16.02 after posting a smaller-than-expected profit. M&T Bank stood out and its shares rose 3.5 percent to $159.87. STOPPED THAT TRAIN: Railroad company CSX fell 2.6 percent to $63.68 after saying its revenue growth will be in the low single digits in 2019. Its revenue rose 7 percent last year. US-CHINA TENSIONS: The trade spat between the U.S. and China remained a chief area of concern for investors. Late Wednesday, the Wall Street Journal reported that U.S. prosecutors are investigating Chinese technology giant Huawei over possible theft of trade secrets from T-Mobile and other U.S. companies. Intellectual property rights and theft of trade secrets is a central issue in the trade dispute, and criminal charges could ratchet trade tensions even higher. But on Thursday, China's government said the top trade envoys from both countries will meet in Washington later this month, a possible sign of progress toward ending their dispute. TARNISHED: Signet Jewelers plunged 22.3 percent to $25.93 after it said its holiday season had been difficult and slashed its annual forecasts. The company said competition grew tougher in December and sales of some key products were weak. The company also said fewer customers came to its stores last month. A series of big luxury retailers including department stores like Macy's have said they struggled over the holidays even though consumer confidence is high and pay for workers is rising. The stock market's steep losses in December appear to have made some consumers reluctant to splurge. HARD DRIVE HARD TIMES: Western Digital lost 6.4 percent to $35.42 and Seagate shed 3.2 percent to $38.44 as digital storage companies sank. OVERSEAS: The British FTSE slipped 0.5 percent and the CAC 40 of France fell 0.4 percent. Germany's DAX dipped 0.3 percent. Hong Kong's Hang Seng dropped 0.5 percent and Japan's Nikkei 225 index edged 0.2 percent lower. South Korea's Kospi added 0.1 percent. BONDS: Bond prices headed lower. The yield on the 10-year Treasury note rose to 2.74 percent from 2.73 percent. ENERGY: Benchmark U.S. crude oil fell 1.8 percent to $51.37 a barrel in New York, while Brent crude, the international standard, declined 1.4 percent to $60.49 a barrel in London.